When it comes to a big sit down meal, my vote is always for Turkey. My Mom raised me right in this regard, not hesitating to put a turkey in the oven at moments notice for any reason or no reason. A turkey dinner makes the house smell great all day, you get to eat a ginormous meal with as many side dishes as desired, and there are leftovers for days. DAYS! I love everything about it. I freeze all the turkey bones so that even months later I can still enjoy the leftovers in the form of turkey soup. 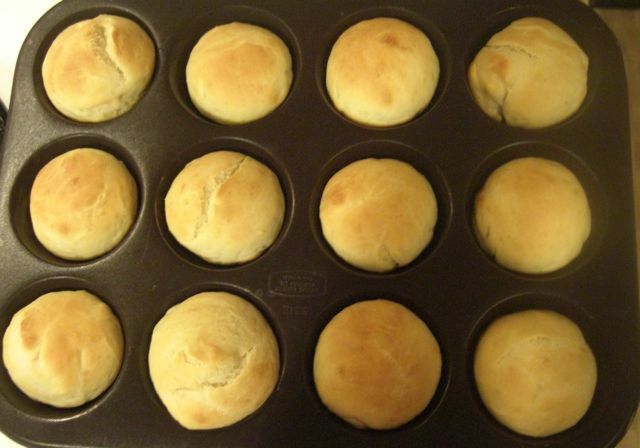 I made some on the weekend and it was yummy as always. Step one: make a turkey, eat lots, then freeze the bones. 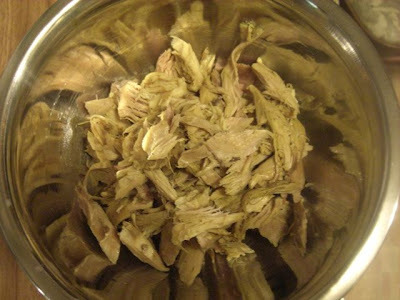 Place the turkey bones into a pot of water. Sometimes there are A LOT of bones, so I spread it over two pots. It makes more stock and if we are talking about turkey soup, more stock = the better. Add some chopped onion, garlic, and turmeric to give the stock some flavour/colour. Let boil for an hour and a half. The house will start to smell like turkey and that is amazing. 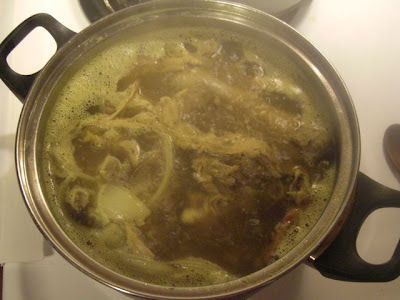 Drain the stock into a new pot, and keep the bones - we aren't done with them yet. 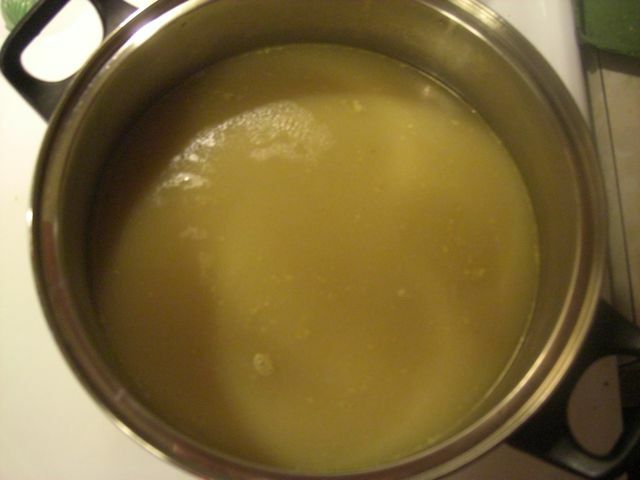 The two pots have boiled down to one pot of glorious stock. It has a definite taste all on it's own, but it is time now to spice it up and add veggies! Spice it up: salt and pepper, garlic salt, sage, spicy chili mix, turmeric (for colour). 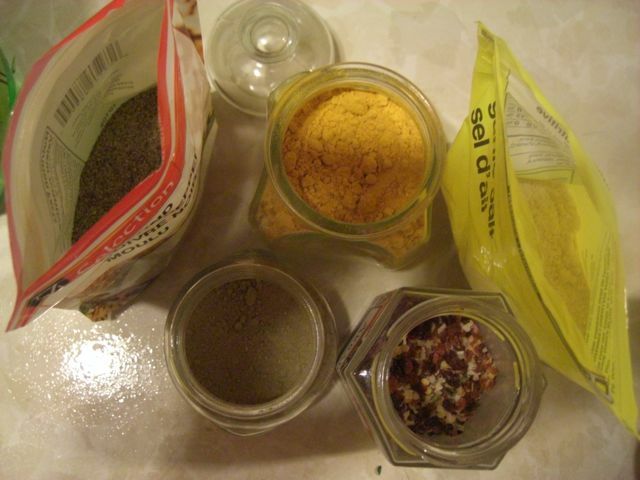 Add whatever spices are to your taste! 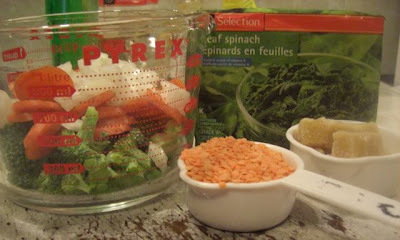 Add veggies: I add what is on hand. This soup has broccoli, carrots, onions, spinach, lentils, tofu, rice, and garden green beans. Add all your favourite veggies! Now it is time to revisit the boiled bones. 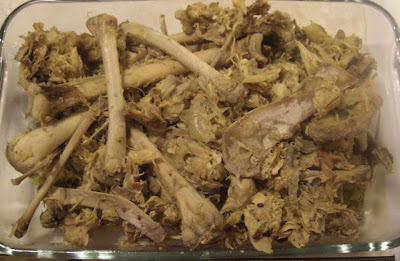 In this pile of bones are tasty chunks of turkey meat - you just have to sort through and find them. It is a little messy, but I actually like this part. It feels good to use all of the turkey that I can. Waste not, want not, right? And then you find yourself with a cup or so of turkey meat. Add it to the soup for an authentic blast of turkey in every bite! Making turkey soup is a fantastic opportunity to make dinner rolls. 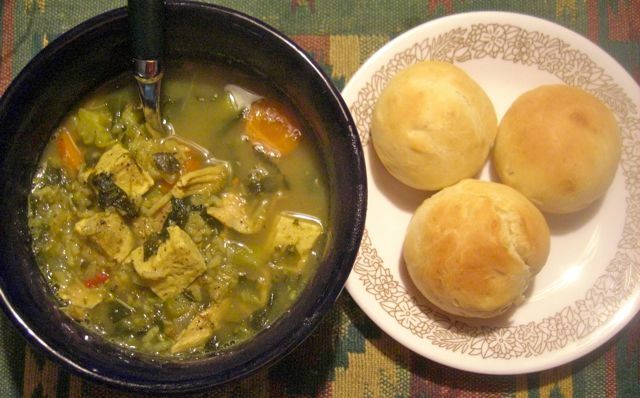 There is nothing like a fresh baked roll dipped into this mouth watering soup! For me this is absolute food bliss.